Canopy Safari is the adventure of a lifetime not to be missed by anyone. Built in 1997 on our private rainforest reserve, this canopy tour has many exciting elements that are sure to get your heart pounding. Throughout the canopy course your expert bilingual guides will reveal the secrets of the jungle that surrounds you. 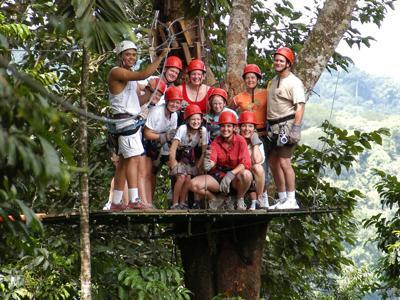 Canopy Safari is the pioneering canopy tour operator in the Southern area of Costa Rica. The company built its first canopy course in 1997 with the help of a team of experts who build high ropes courses in the United States and in Europe. Our tour begins with an amazing drive through the rainforest out to our canopy site in Quepos. During the ride there are many stops for everyone to learn about the flora and fauna of the area. Our local bilingual guides have a vast knowledge of the area and love to share the many secrets that the rainforest holds with our clients. The canopy site is located approximately forty-five minutes from Manuel Antonio Park, in an area called Paso Real. Here we have a brand new ranch house with full facilities, located next to a pristine river, this is where we serve a full breakfast or lunch (depending on tour time). A spectacular river is the backdrop for these platforms carefully built in the canopy of the rainforest in Costa Rica. Clients are able to traverse from tree to tree and platform to platform using pulleys on horizontal traverse cables, as they sail through the treetops of the tropical rainforest canopy, and over the trails far below. 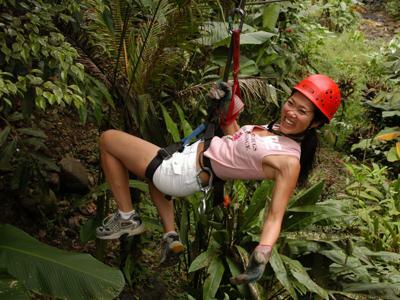 We are the only canopy tour in Costa Rica with a Tarzan swing, which adds much more excitement for the clients. Our expert guides assist the clients in this exciting journey through the different layers of virgin and secondary rainforest. They point out and explain the many different types of flora and fauna; from poison dart frogs, to the “walking palm tree”. As a result; at the end of the tour our clients are able to walk away with a newfound knowledge of Costa Rican wildlife. Our butterfly garden is a beautiful place to relax after the excitement of the canopy course. From within the butterfly garden you can see the whole life cycle of the butterflies; from the eggs on the plants to the butterflies emerging from the pupas and flying their first flight. The vast collection of native Costa Rican snakes will amaze you. One of the new attractions to our already interesting and exciting tour. 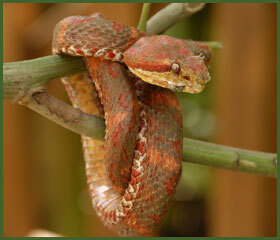 Walk through our serpentarium and see the many different species of snakes, poisonous and non poisonous. For some people scary, for others just impressive. Come and experience some of these incredible creatures. This tour is available for anyone over the age of five. There is no need to brake on any of our cables. The first cable leaves from our restaurant "La Quebrada" and the the last one returns to it as well. Here at Canopy Safari safety is our top priority. We perform safety checks daily on all our equipment including anchors, cables, and connections. Our harnesses, carabiners, and other equipment pass all standards set by the international association ACCT. We are proud to announce that Canopy Safari is one of only few canopy tours in the country approved by ICT (the Costa Rican Tourist Board).To receive their approval our company has undergone extensive and constant training regarding the safety and construction of our tour. All Canopy Safari guide are individually certified by ICT as canopy tour guides, and has taken numerous courses on safety, rescue and first aid. We also hold extensive insurance policies for our vehicles and for our clients. Sturdy shoes, shorts, camera, insect repellent, bathing suit, towel, change of clothes in rainy season. A five hour adventure into the heart of the Costa Rican rainforest, a delicious typical style meal served in our La Quebrada Restaurant, fully bilingual experienced guides certified by the ICT and by the ACCT standards, a guided tour of our butterfly garden and snake exhibit, all equipment, a professional photographer to capture all your memories (rate does not include pictures), pick up and drop off at your hotels.